A game by 13AM Games for PC and Switch, originally released in 2019. Double Cross is an action-adventure starring Zahra Sinclair, an agent of RIFT (Regulators of Interdimensional Frontiers and Technology), which is tasked with policing a multiverse of infinite earths containing variations of the planet’s history, some of which have led to drastically different outcomes. 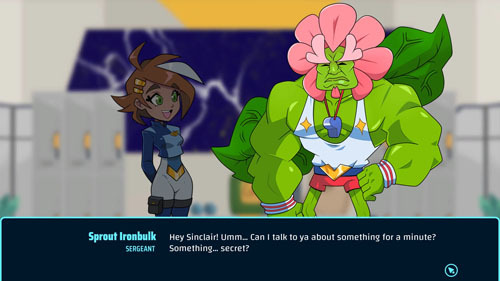 Using interdimensional travel, criminals are able make trouble for their neighboring realities, and recently a criminal wearing a mask – and believed to be a former RIFT agent – infiltrated RIFT Headquarters, stealing a dangerous energy source known as the “metacatalyst”, which could potentially be weaponized. The narrative is quite detailed and takes into account various possible consequences of interdimensional travel, such as a creature entering another world where the dominant species makes an excellent food source, smuggling resources out of one dimension and into another, meeting an alternate version of yourself in another reality, or smaller issues like the much-discussed Mandela Effect, which led to supposed alternate spellings of The Berenstain Bears. 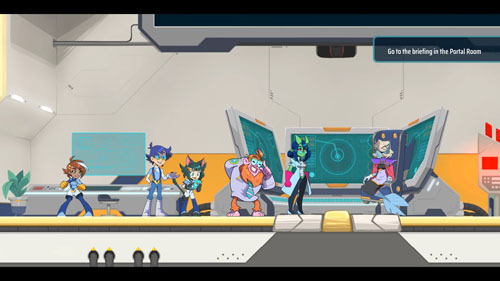 Before Zahra sets out on her mission, she wanders about RIFT Headquarters meeting all of the other agents. During the attack by the masked assailant, she completes a short platforming sequence that introduces the game’s basic mechanics. 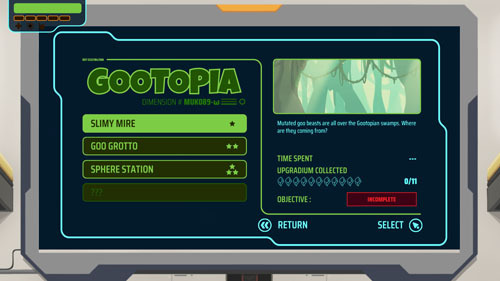 Along the way, she discovers a few pieces of evidence, which must then be shared with the appropriate RIFT agents in order to complete a short investigation sequence. Once this is complete, Zahra must visit the Commissioner to share the results of her inquiry, which then unlocks three alternate earths for her to visit and continue her investigation. This is the basic structure for the game as a whole, with the player visiting each alternate earth, gathering a few pieces of evidence, sharing said evidence around RIFT Headquarters, and slowly building a case for prosecution of the criminals behind the illicit activities. 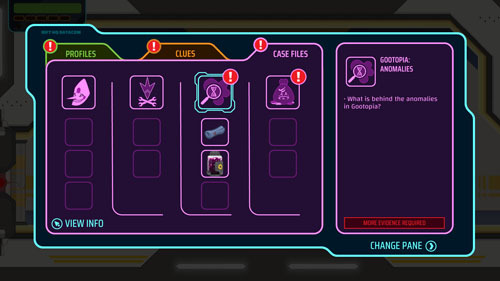 Each world has three levels accessible from the start, each with a piece of evidence, and collecting all of them allows the player to present a case to arrest the villain in charge, which unlocks that world’s boss encounter. All three worlds are open from the start, as are the levels within them (boss battles notwithstanding), so players are free to tackle them in any order… although there is a difficulty rating associated with each, and players are encouraged to play the easier ones first. 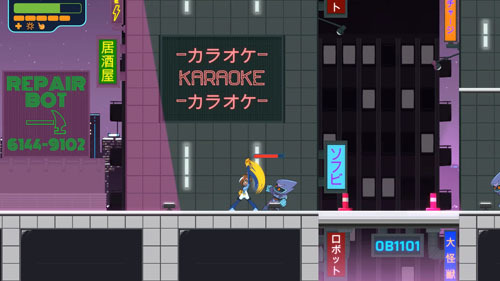 While investigating each of the three worlds, the player slowly builds a case against the masked attacker – referred to as Suspect X – leading to a final confrontation. In most straightforward action games, narrative details of such an investigation would be relegated to cutscenes, but here, the player spends a significant amount of time between missions having conversations with the folks in RIFT Headquarters. Each piece of evidence needs to be brought to the person who is an expert at analyzing that sort of information, and sometimes one discovery leads to another, which requires additional follow-up with the other NPC’s in the area. There is also a game-spanning side story involving a creature who was detained after accidentally warping into another dimension, and then decides he would like to become a RIFT agent himself. There’s a bit of humor to be found as well, at least for players with plenty of patience for extended narratives, including frequent jokes and puns. 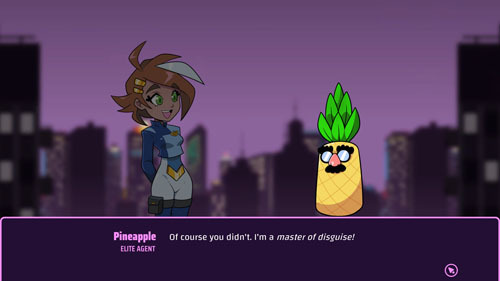 For instance, one of the RIFT agents is a pineapple and he is known as a master of disguise, despite rather obviously being a pineapple, and there is a sentient crate who refuses to give up its contents until a password is provided. Zahra has a 2x variable jump, a dodge roll, and she is able to wall slide and wall jump. She cannot wall jump up vertical surfaces, but she can triangle jump between walls to jump upward, and she is capable of grabbing ledges and jumping up to mount them. Zahra has a light attack that she can string into a fast 3-hit combo, and she has a heavy attack that can be used on its own or strung into the end of a combo to perform an uppercut. Light and heavy attacks may be performed on the ground or in the air, and the player is eventually able to unlock other attacks, including a jump kick, sliding kick, and downward strike. Zahra’s most important skill is her energy-based grapple, which lets her grab onto objects, including some enemy projectiles, and fling herself around using grapple points suspended in the air. This skill is used often for environmental navigation, with increasingly complex scenarios being offered in tougher levels. 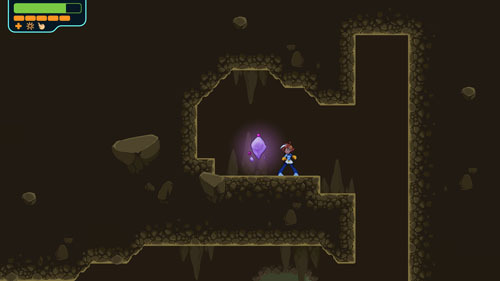 Players are able to grab thrown objects out of the air, which may then be turned against enemies, or occasionally used to break objects in the environment to open the path forward. Time slows down for a moment while the player is targeting, allowing him to line up his shot, or string together multiple grapples in midair, although the effect only lasts a few seconds, requiring the player to act quickly. Despite the array of offensive abilities available to the player, enemy behaviors are quite simple, and they attack slowly, allowing players to defeat most enemies by simply mashing the ATTACK button until they blink out of existence. Enemies aren’t terribly reactive either, offering simple animations without much in the way of damage reactions or accompanying sound effects to indicate that they are being harmed. Even something as zany and incredible as crushing a dinosaur with a giant piston simply results in the creature flashing and disappearing as it falls off the bottom of the screen. Defeating enemies causes them to drop little yellow orbs which feed into a secondary meter. 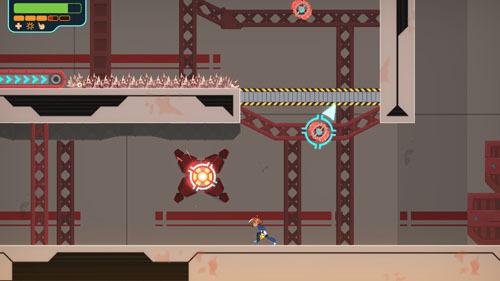 The player is able to perform a few different functions once the meter reaches certain thresholds, including unleashing a powerful projectile attack or sending a shockwave outward at a small distance. The meter can also be used to spend toward health restoration, allowing the player to heal on the spot, although healing can only be done while standing still and doing so takes a few seconds, so it’s risky to attempt during combat. 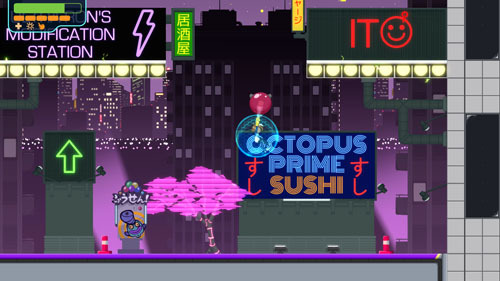 The three worlds available to the player are Gootopia, a planet filled with various sorts of slime and gelatinous life forms; Reptarria, a world where dinosaurs never went extinct and have since evolved into sentient lifeforms; and The Funderdome, a world where robots have overthrown their human creators, and it’s filled with skyscrapers, neon lights, conveyor belts, and even an arcade. 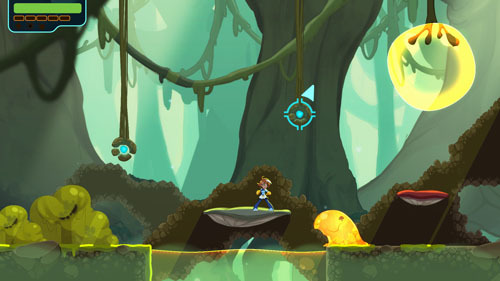 Level designs and obstacles vary significantly between worlds, so there is a fair amount of variety to be found in environmental navigation, even if the combat isn't terribly compelling. That said, levels are quite long, with most taking 20-30 minutes to complete. Hidden throughout each of the levels is a substance called “upgradium”, which allows you to unlock new equippable perks and permanent upgrades. Upgradium takes the form of purple shards, and these are always located off the beaten path, often behind false walls or in hard-to-reach areas. Only the most thorough players are likely to find them all on a first run through the level. Each shard collected also counts toward the player’s level, with health upgrades and new combat moves permanently unlocked upon reaching certain thresholds. Unfortunately, given the simplicity of the combat, these upgrades aren’t terribly valuable to the overall experience. 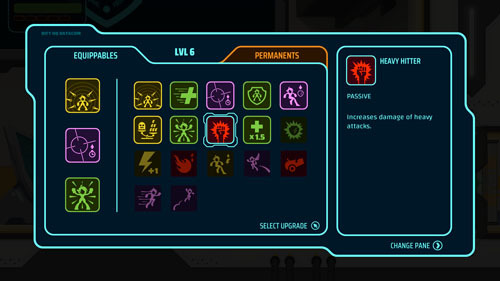 In addition to permanent upgrades, the player unlocks a variety of new abilities, and he is able to equip three of these abilities at once, swapping them between levels or at checkpoints (which appear frequently). These upgrades allow the player to tailor his strengths toward combat, healing, and/or environmental navigation. These include the ability to heal more quickly, hang in the air longer when grappling, create a regenerating shield, eliminate damage taken from spikes, increase speed and jump height, and increase damage output, among others. Level designs in Gootopia are quite interesting as the player is able to jump through goo cubes, dislodge towering stacks of gelatin and then jump up through the goo to reach higher areas, and use different colored goo to slide along the floor, bounce into the air, or stick to walls or the ceiling Splasher-style. 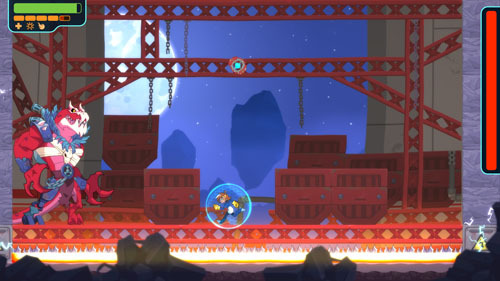 On some occasions, the player is able to carry colored goo-balls and toss them at the walls and floors to create sticky or bouncy surfaces, and there are some clever puzzle-platforming sequences that require the player to land on bouncy goo from great heights to perform incredibly high bounces. Reptarria features dinosaurs as your primary foes, and these levels take place in mostly factory-style settings, with conveyor belts (including ones on vertical surfaces! 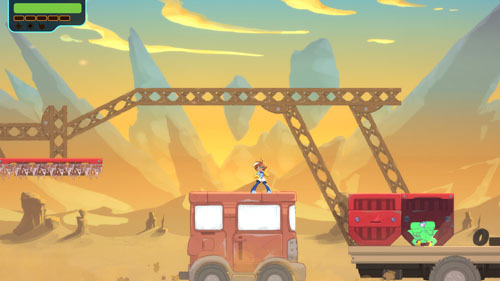 ), shipping crates, crushing pistons, and pools of molten steel… although the final area takes place on a moving train and offers some unique platforming challenges combined with grapple zip lines. 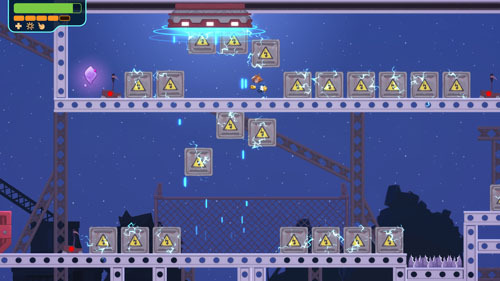 Some of the factory levels feature magnetism as a puzzle element, requiring that you use moving magnets to raise and lower shipping containers to clear the path forward. 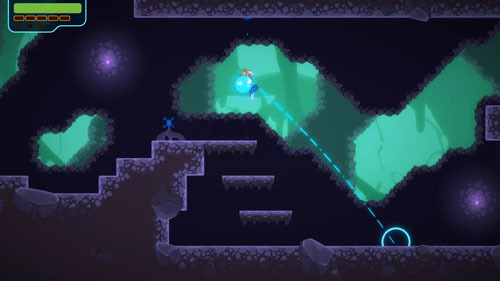 Some locked doors can only be opened by grappling and carrying an orb through the level, which prevents you from using your grapple beam during this time. The low-contrast visuals here occasionally make it difficult to parse foreground and background elements. 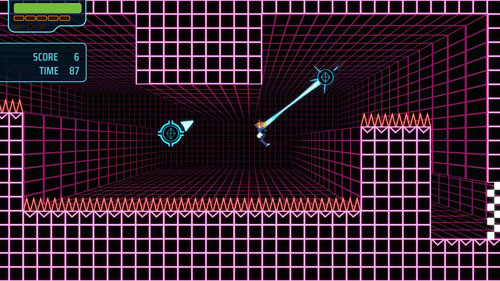 The Funderdome sees you making jumps between skyscrapers, grappling multiple times in succession, and holding onto floating balloons and steering them between obstacles, with failure causing you to fall down into a lower part of the level to try again. Unfortunately, this design also makes looking for upgradium a bit cumbersome as most alternate routes only exist as a punishment for failing the platforming challenges. The Funderdome also features an arcade, which comprises the entirety of a single level. Here, the player is meant to enter the arcade’s VIP room, but he is only allowed to do so by getting his name on the high score tables of six arcade games. 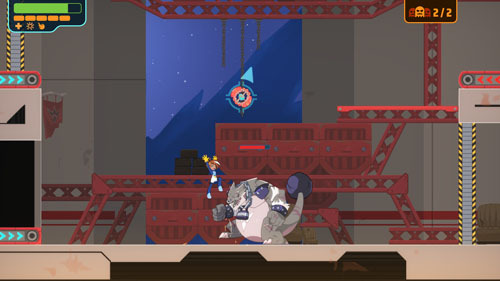 These arcade games have you performing actions typical of the rest of the game, such as grappling, destroying objects, or fighting enemies, but you are placed on a grid-like background. Completing most of these challenges is fairly easy (although the first one is more challenging than the others and allows little room for error), but the only way to get upgradium in these levels is to achieve the top score. Getting killed results in very little lost progress, as the player is respawned at the closest safe spot as long as he has health remaining, or returned to the most recent checkpoint if he does not. 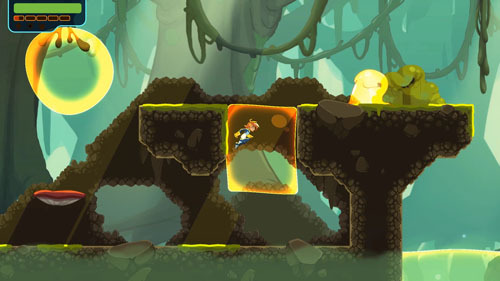 The game’s primary challenge comes from completing platforming and grappling challenges, which change between levels, offering unique challenges and a bit of variety. 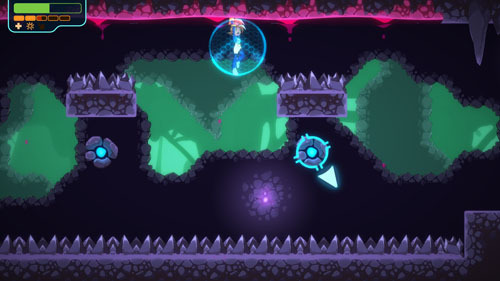 Many enemies can be avoided in favor of simply moving through the levels, but often the player is locked in an arena to fight several waves of enemies before being able to push forward. Boss battles are varied and require you to make use of the skills you acquired up to that point. For instance, the boss at the end of Gootopia emits slime of various colors and requires you to make use of it to move around the arena and reach objects that must be grappled. These battles mix platforming and grappling challenges to expose the bosses’ weak points, allowing you to follow up with physical attacks to wear down their health bars during their limited vulnerability periods. These battles also represent the few occasions where dodge rolling is needed to avoid taking too much damage. Double Cross was developed by 13AM Games, a 9-person studio based in Toronto, Canada. The studio previously released Runbow and Pirate Pop Plus. The game was published by Graffiti Games, which also published The King’s Bird and Joggernauts.